Fishing has started to pick up in the main river, but the heavy wind is making it difficult to capitalize on it. 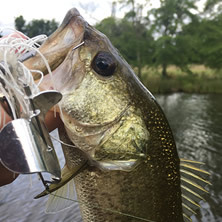 Although, there are also good reports of bass in the wind-sheltered creeks and bayous as well with spinnerbaits, crankbaits, and top-water frogs. Good reports of flounder coming out of the mobile river and dog river. The speckled trout are showing up in deeper water (8-12ft) so, time to bust out ya slip cork rigs.